One of the great things about a side by side is it’s hauling ability. Now you can add a new dimension of packing capacity to any UTV with a 2” hitch receiver using Great Day’s Hitch-N-Ride Rear Cargo Rack. Constructed of aircraft aluminum, Great Day’s Hitch-N-Ride UTV Rear Cargo Rack is light weight and heavy duty. Although it only weighs 22 lbs it can handle a whopping 400 lb. load. It’s low center of gravity makes it easy to load and unload gear and equipment without straining or stressing your body. The Rack is 22” by 50” by 6” and provides plenty of tie down points for a secure transport. 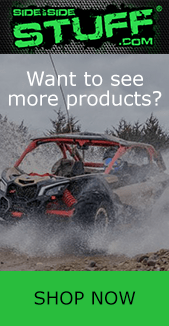 This product also includes a Z-Bar attachment bar that raises the Cargo Rack by 7″ allowing more clearance for traveling over rugged or uneven terrain. Can handle up to 400 lbs. To purchase this product for your SxS visit SideBySideStuff.com.